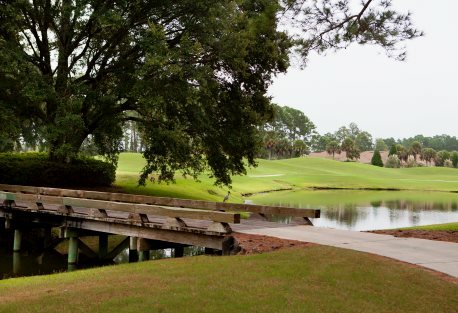 Unspoiled, uncrowded and undiscovered, Osprey Cove offers a tremendous value in private club community living. “The community’s best features are the natural ones–water, marsh and natural views surrounding, and throughout, the community,” says Paul Larner, a principal in Bald Eagle Part­ners, the owner of Osprey Cove. Stretching across 1,059 acres of lush coastal Georgia terrain, Osprey Cove is only a few miles from unspoiled sandy beaches and is just minutes from Jacksonville, Amelia Island and historic St. Marys. Famed Cumberland Island is just a ferry ride away. Shopping, dining and the many varied opportunities of northeast Florida give Osprey Cove residents quick access to shops, restaurants and a major international airport. The community’s 18-hole Mark McCumber golf course is a nationally ranked gem. The River Club is the place to be for many of the residents and complete access is available through a Social Membership (golf can be added separately). Whether you want to play tennis on the Har-Tru clay courts, exercise in the state-of-the-art fitness center, relax at the pool (open year-round), take in a fitness class such as Zumba or Yoga, or attend one of the many interest-club meetings, such as the Garden Club or Bridge Club, you’ll find plenty of fun things today. And the social calendar is always filled with events and happenings. 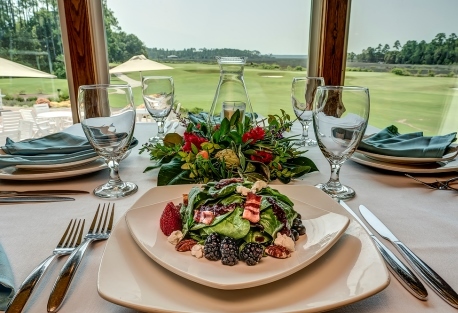 Great food is an important part of life at Osprey Cove. Whether it’s a casual poolside lunch or fine dining, meals are prepared fresh daily in-house, using recipes that vary based on the season and local ingredients. Two restaurants, the Clubhouse’s Grill Room and River Club’s Tiki Hut provide the ideal venue for celebratory occasions–a wedding, a milestone birthday or just dining out. The course is embraced by marshes & tidal inlets. The year-round Osprey Cove course is set against a backdrop of sweeping marshes, tidal inlets and nature conservation areas. 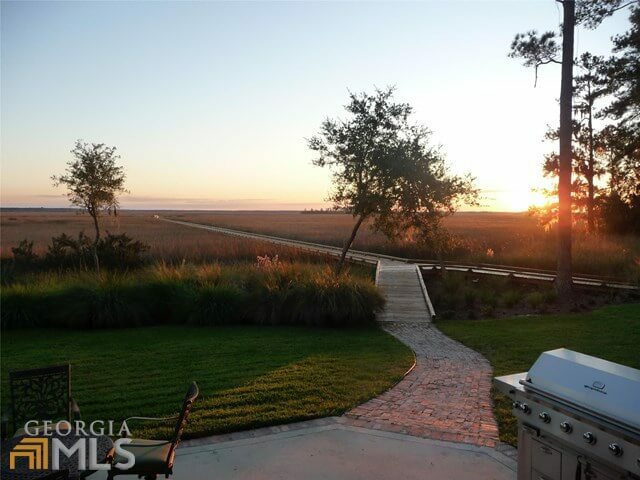 At every turn, the breathtaking panorama of the Lowcountry envelops you. The newly renovated clubhouse offers sweeping views of the course and the marsh beyond. Designed by Mark McCumber & Associates, the layout is a testament to McCumber’s commitment to establishing a course that is defined by the natural characteristics of the land and river. With social membership, you will enjoy tennis, fine dining, fitness facilities and classes, access to the private boat dock, RV/boat storage and clubs to satisfy every interest. Add a golf membership and a nationally-acclaimed course is at your disposal. Enjoy privacy with top amenities nearby. Water is integral to life at Osprey Cove. With the St. Marys River running through the spectacular marshes that cozy up to the community, and the ocean within easy reach. Members love kayaking the river, meandering down the boardwalk along the river’s edge, taking a sunset cruise, grabbing a drink with friends at the marshfront Tiki Hut, or fishing for tarpon, Spanish and king mackerel, cobia and reds. Club members have two easy means of access to the Intracoastal Waterway–they can venture out from their home via their own private dock or by way of the community’s dock. Just minutes away is the Cumberland Island National Seashore, the largest and southernmost barrier island in Georgia. Here you’ll find 18 miles of white-sand beaches perfect for beachcombing. You’ll also catch a glimpse of wild horses, dolphins, sea turtles, shore birds and much more. And, of course, for those who choose a marsh or riverfront home or homesite, the joys of life on the water are never-ending. Whether you are looking for a quality pre-built home or want to build your own vision on the perfect homesite, Osprey Cove offers you compelling options. Everything from smaller, maintenance-free single-family homes to dramatic custom homes are available. And if you want to build, choose from among homesites with views of the golf course, lake and preserves or dockable homesites with views unrivaled in the area. Best of all, Osprey Cove is a well-established, financially secure community with all amenities in place, including recently completed upgrades valued at $3 million. Add in a moderate year-round climate and you can buy with confidence. Set on the Georgia coast, Osprey Cove offers a life that is unspoiled and uncrowded. But adventure and action are just minutes away in historic dowtown St. Marys, Jacksonville and Amelia Island. Big city amenities, small town charm, cultural events and world-class healthcare are all at your fingertips. In just 25 minutes you can be at the Jacksonville International Airport. In half that time you can reach the ferry in St. Marys and enjoy the ride to famed Cumberland Island, one of the most spectacular natural habitats in the Northern Hemisphere. Osprey Cove owners love taking day trips to take advantage of the culture, sports, recreation, history and incredible natural beauty at their disposal, but at the end of the day they always get to return to the familiar environs of Osprey Cove. 8. Just 90 Minutes Away – Savanah, GA & St. Augustine, FL, Charleston, SC – 2.5 hours., Orlando, FL – 3 hours. Osprey Cove, St. Mary’s GA presents a chance to explore life on the beautiful Georgia Coast with its Discover Osprey Cove package. Enjoy three days and two nights’ accommodations, an 18-hole round of golf for two on the club’s championship course, a dining certificate for use at the Clubhouse or marsh-front Tiki Hut, access to the newly renovated River Club, fitness center, Har-Tru tennis courts, walking trails and junior Olympic swimming pool, all in this beautiful coastal community. A tour of the Osprey Cove community and its real estate opportunities is also included. Price for the package is just $199 per couple. Send me more information about this Osprey Cove discovery! Explore this popular option for visiting Osprey Cove and experience for yourself the setting and lifestyle its members love. Discover Life on the Georgia Coast. Discover Osprey Cove through our Discovery Visit. Three days & two nights for just $199 per couple. Enjoy this wonderful and popular option for visiting Osprey Cove and experiencing for yourself the setting and lifestyle our members love. Three days and two nights’ accommodations. An 18-hole round of golf for two, including cart fee, on our Mark McCumber championship course. A dining certificate for use at the Clubhouse or marsh front Tiki Hut. Access to our newly renovated River Club, fitness center, Har-tru tennis courts, walking trails & Jr. Olympic Pool. A private Osprey Cove boat tour on the St. Marys River (advanced reservations required). A tour of the Osprey Cove community and its real estate opportunities. Builder visits and idea sessions may be scheduled as well. For More Information, click the green tab to the right or here: Send me more information about the Stay’n Play!